Remove brake and rail dust from your paint and rims! Gyeon Iron will help you remove ferrous deposits such as brake dust and rail dust safe and easy! This unique formula is strong enough to remove this tough contamination, yet gentle and pH neutral. This means Gyeon Iron will make quick work of caked-on brake and rail dust, while being safe to apply on your paint, wheels, trim, glass, etc. To apply, start with a cool wet surface and simply spray this product onto the desired area, letting it dwell. After about 60 seconds you will see the formula change to a deep purple. This illustrates that the formula is reacting and removing the deposits that are on the surface or embedded in the finish! Follow up with a rinse and you are all set. What you will be left with is a clean surface, free of iron and brake dust! Remember to never let the product dry on the surface and to thoroughly rinse or wash off once finished. For any heavily soiled areas, we recommend multiple applications and/or agitating with your favorite detailing brush. Grab yourself a bottle of the Gyeon Iron, brake dust won't thank you, but your car certainly will! 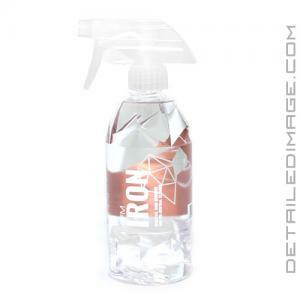 Effective iron remover and pH neutral cleaner. Suitable for paint, wheels and glass. Body shop safe, pH neutral. Apply on a pre-washed surface. Let it work for 2-4 minutes until the product changes it's colour. Wipe with a soft sponge (paint) or brush (wheels). Use eye and skin protection. May cause skin irritation, seek medical attention. Works great, the 500ml bottle was plenty for a full size ram 1500 crew cab top to bottom. Spray on, let rest 3-4 minutes then I give a quick water spray to suds the product. It suds just enough as soon as the water hits it to create a very slick surface, enough to then wash over it with a wet mitt as you would normal. Rinses clean but like the rest of these types of products it will stink up your area if used indoors. Also, drips onto concrete seem to turn purple, I imagine there is some iron on the surface. I was a little worried it might stain but a thorough fresh water rinse and it left no purple residue so don't worry. Work as described and be prepared to use a good amount to car the whole car. Great product on removing embedded contamination and iron particles.